You may remember last Holiday season we had a stray dog show up. She was beyond sweet, but with a house full of cats, she was not a good mix. The power of the Internet came into play. I sent her photo to Virginia, it was forwarded to Vermont, sent back to Virginia and forwarded to a neighbor who just happened to be looking for a new dog. We drove our Bunnymellon to Virginia where she became Cris and Maria's Maddie. This summer we saw Jason and Neville, who sent us to Cris and Maria. Jason said Maddie was a ball of energy and he shared some photos. Evidently, Maddie is a bit hard to photograph due to her bounding energy. It seems that most photos of her are just a blur. We took a famous "video" of the future Maddie as an introduction for her prospective owners. The video was about a minute of my feet, as even then, Maddie was hard to photograph. For Christmas, Teddy and the Halloweener cats sent Maddie a little present. I think their Christmas joy was motivated by the fact that they were joyful Maddie was no longer in such close proximity. It's a cat thing. 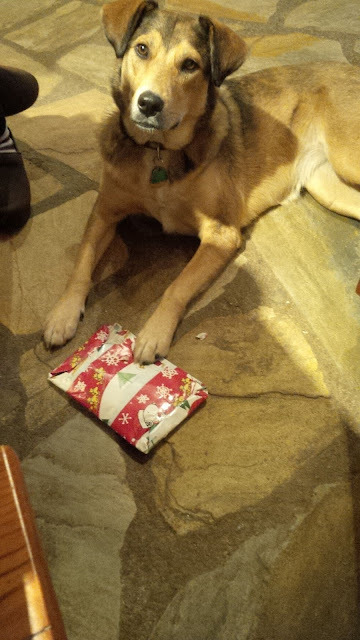 Finally, we were able to see a calm photo of Maddie, with her Christmas gift. She is no longer skin and bones, but a healthy and wildly happy dog. It was a great present.